Rather than comply with the Crown's order, the illegal settlers —mostly concentrated at the Watauga settlement at Sycamore Shoals (in present-day Elizabethton), the Nolichucky settlement (near modern Greeneville), and Carter's Valley (near modern Kingsport) —decided to lease their land from the Cherokee, and in 1772 established the Watauga Association, which was the first independent American constitutional government west of the Appalachians. In 1775, the Watauga and Nolichucky settlers purchased their leased lands outright and formed the independent Washington District. They almost immediately petitioned Virginia for annexation, which was denied. The Crown and the colonial governments (especially Virginia) considered the land purchases illegal, and ordered the settlers to leave what they considered to be Cherokee lands. Also, some factions of the Cherokee became agitated when these settlements began expanding rapidly, and tribal chiefs amiable to the settlers fell out of favor. A young Cherokee chief, Dragging Canoe, who had been opposed to the sale of tribal lands, called for the violent removal of all European settlers west of the mountains. He led an estimated one thousand followers (eventually referred to as the Chickamauga) away from the American settlements and carried on an armed struggle against the new country for almost twenty more years (see the Cherokee–American wars) after the failed Cherokee attacks against the Overmountain settlements in the summer of 1776. Abingdon Muster Grounds - The northern trailhead of the 330-mile long Overmountain Victory National Historic Trail. 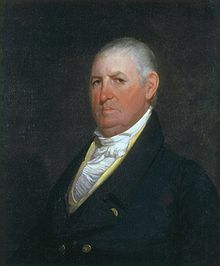 In later years, Sevier and Shelby played important roles in the establishment of Tennessee and Kentucky, respectively. Other influential Overmountain Men included John Crockett (father of Davy Crockett), William Lenoir, Joseph Dickson, Daniel Smith, William Russell, and John Rhea, all of whom were at Kings Mountain, and Anthony Bledsoe, who commanded the homeguard for the Holston settlement while the main force was away. 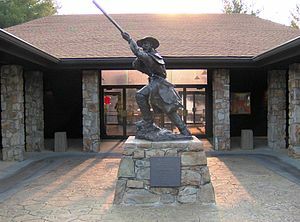 In 1980, Congress appropriated funds for the establishment of the Overmountain Victory National Historic Trail, which follows the original marching route of the Overmountain Men between the mustering grounds at Sycamore Shoals State Historic Park and battle site at Kings Mountain National Military Park, and includes several branch trails in Virginia and North Carolina. The Shelving Rock site, where the Overmountain Men camped on the first night of their march, was added to the National Register of Historic Places in 2009. The Overmountain Men are the subject of numerous books, including a historical novel by Cameron Judd, and a play entitled The Wataugans. ^ Borden Mace, "Overmountain Men." Encyclopedia of Appalachia (Knoxville, Tenn.: University of Tennessee Press, 2006), p. 1607. ^ a b c John Finger, Tennessee Frontiers: Three Regions in Transition (Bloomington, Ind. : Indiana University Press, 2001), pp. 47-52. ^ a b Finger, pp. 58-71. ^ Pat Alderman, Overmountain Men (Johnson City, Tenn.: Overmountain Press, 1970), pp. 52-53. ^ a b c d Alderman, pp. 81-96. ^ Susan Goodsell, Mary McKeehan Patton. Tennessee Encyclopedia of History and Culture, 2002. Retrieved: 18 June 2009. ^ "Official site". Abingdon Muster Grounds. Retrieved 30 September 2015. ^ C. Hammett, The Battle of Kings Mountain. TNgenweb.org, 2000. Retrieved: 15 June 2009. ^ The March from Sycamore Shoals. Originally published as Historical Handbook Number Twenty-Two (U.S. Government Printing Office, 1955). Maintained on the web by Kings Mountain National Military Park. Retrieved: 15 June 2009. ^ National Park Service, Battle of Kings Mountain – map. Retrieved: 15 June 2009. ^ The Battle of King's Mountain. The American Revolution.org, 2001-2007. Retrieved: 15 June 2009. ^ David Eggenberger, A Dictionary of Battles (New York: Crowell, 1967), p. 220. ^ Alexander Chesney, E. Alfred Jones (ed. ), The Journal of Alexander Chesney (Ohio State University, 1921), pp. 72-73. ^ Joseph Greer. Tennessee Society of the Sons of the American Revolution — General Joseph Martin Chapter, 2004-2006. Retrieved: 15 June 2009. ^ Augustine Webb. Tennessee Society of the Sons of the American Revolution — General Joseph Martin Chapter, 2004-2006. Retrieved: 15 June 2009.